From 1 July 2017, the Federal Government will lower the annual concessional contributions cap to $25,000 for all individuals as part of its 2016–17 Federal Budget Superannuation Reform Package. To help you to understand how this change affects your super, we have developed a concessional contribution estimator. 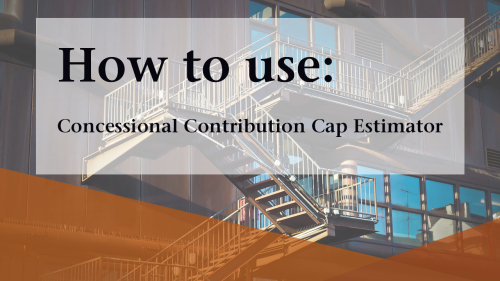 The estimator is a simple-to-use, online tool to calculate your Concessional Contributions Cap Space - the difference between the concessional contributions cap and how much you have paid in concessional contributions across all your superannuation interests. It is designed to help you manage your concessional contributions and avoid potential penalties for exceeding the cap. For more information about the changes to the treatment of concessional contributions, see our Changes to Concessional Contributions. For information about other measures in the Government’s Superannuation Reform Package, see our 2016-2017 Federal Budget page. Note: The concessional contributions estimator may not display correctly on older versions of Internet Explorer (such as IE6 or IE7). We recommend using Chrome. How will I know if I have reached, or will reach my maximum benefit limit? Based on the published limits for the relevant period, you have determined that you will reach your pension MBL in the period being estimated. Note that even if you determine that you could reach your lump sum maximum benefit limit, only check the box where you intend to stop making contributions. Are concessional contributions being made for me if I have reached my MBL and am no longer contributing? As a MilitarySuper member, if you served at any time during the year, you will accrue concessional employer contributions which are counted toward your concessional contribution cap. All MilitarySuper members who have served at any time during the year are regarded as accruing members – even those that have reached their MBL either before or during the period being estimated - with the exception of members on leave without pay for more than 21 days. What is my superannuation salary? For MilitarySuper, your superannuation salary is the total of your estimated actual salary plus the annualised value of your service allowance, any non-reduction pay (NRP), and any higher duties allowance (HDA) for the period entered. This value is used to estimate your productivity contributions for each period. Note that your defined benefits contributions are estimated using your earliest superannuation salary for the period being estimated. If I take leave without pay, are concessional contributions accruing? If your leave without pay period is less than 21 days, even where it includes one or more paydays, you are still considered a contributing member and will accrue concessional contributions for that period. Where your leave without pay is greater than 21 days, member (non-concessional) and productivity (concessional) contributions of any type are no longer payable; however, notional defined benefits (concessional) contributions continue to accrue for the period. What is counted toward my concessional contribution cap? For MilitarySuper, this tool will estimate your employer productivity and notional defined benefits contribution values and display the estimated total value that would be counted toward your concessional contribution cap, based on the data entered. You are required to enter any other values which should be counted toward your concessional contribution cap in the fields provided for the period being estimated. What happens if I exceed my concessional contribution cap? Your concessional contribution cap may be exceeded where the total concessional contributions paid in a financial year, exceeds the total general concessional cap and any available carry forward provisions for that period, where applicable. The ATO will write to you to advise you have exceeded your concessional contribution cap and any instructions they require from you with regard to the treatment of the excess value. Where those instructions are to release funds from your superannuation interests, the ATO will send a release authority to the nominated fund. Where no fund is nominated, the ATO will send a release authority to your current fund. It is important to note that some concessional contributions are protected from release. For MilitarySuper members, a release will generally only be made from ancillary contributions. For further information about the concessional contribution cap, please refer to the Federal Budget resources.